Whether we are visiting a city as business travellers or as tourists, having breakfast ready and made available to us before leaving our accommodation is certainly an advantage: for sure we won’t be late for our appointments and we will be able to make the most of our trip. In the case of being away on holiday, the daily breakfast buffet will help us save a good amount of morning time that can be spent strolling by the seashore or catching the earliest rays of sun. For this and some other reasons, the majority of travellers appreciate the opportunity to enjoy the first meal of the day as a complimentary feature of their stay, as well as the peace of mind of knowing that they will find food they like amongst the wide variety of categories that hotel breakfasts usually offer, namely continental, American, Full English, Irish, gluten-free, vegan, Halal or Asian, just to give some examples. -You have booked your stay at a B&B: the owners or hosts at a bed & breakfast accommodation will provide fresh homemade-style breakfast every morning. Often times, and according to their degree of dedication, they will ask you in advance in order to offer a personalised breakfast that suits your taste and dietary needs. -You have selected “breakfast-included” while making a hotel reservation: such option will automatically entitle you to access the hotel restaurant or dining area every morning to enjoy this complimentary meal. -The hotel you stay at gives you the chance to have breakfast on site for a nominal extra fee: the difference between the previous case and this one is that here you will only pay for breakfast if you decide to have it and only on those days when you have it. 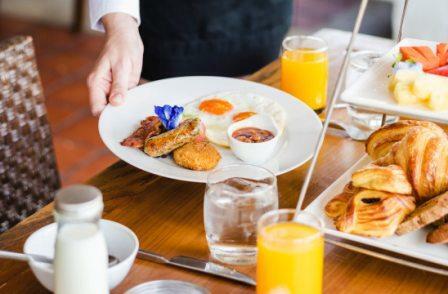 Regardless of their star rating and total capacity, hotel restaurants that serve complimentary breakfast for guests tend to get crowded during the morning, and based on our experience we have gathered a set of rules of behaviour that every traveller should follow. -Hotel staff will generally give you the freedom to choose a table yourself in the dining area; once you have chosen your seat, keep coming back to it no matter how many times you get up to help yourself. –Use the tools and utensils provided so that you do not need to touch the food: keep in mind at all times that you are sharing it with many other people. If the containers are open, avoid coughing, sneezing or even talking directly over them. -When taking pictures of your beautiful hotel breakfast to be posted on social media, take special care that other guests are not captured without their consent. -If eggs, milk or your favourite type of cereal runs out, tell the people in charge politely and find out if they can bring out more. Since hotel personnel frequently supervise containers to detect this, this circumstance is uncommon; however, it might happen during peak-times or in hotels at full capacity. -Fill your plate only if you will finish it up: it is preferable to get up several times rather than to waste food. -If you cannot figure out how the coffee machine works or how to toast bread with the toaster, always ask the staff for help before running the risk of breaking the appliance. -The big debate: taking away hotel buffet food or not? Many travellers see breakfast buffets as a chance to save money by stocking up on food (bread, cold meats, fruit, yoghourt, pastries, etc…) they can carry in their bags for the rest of the day. While it is true that nobody will blame you for taking those two extra muffins, shamelessly filling your bag with food from the buffet will be seen as greedy. Rather, you are advised to take advantage of the breakfast buffet and eat a bit more than usual before a day out exploring the city, thus making sure you won’t be hungry for a long period. -Do not show up too late. Service may end at 11:30 am, meaning that you can access the breakfast hall even if it is 11:20, yet this would be somehow inconsiderate towards the kitchen staff or the B&B owners, who might need to exceed their working hours. Besides, in the case of buffet breakfasts, all you might find will be cold leftovers.